The City of Lanzhou can be reached from anywhere in China (P.R.C.) through direct air connections. As the arrival point for many, the Lanzhou ZhongChuan Airport is located far North and outside the City at some 70 kilometers distance. The best way to travel around the Province and appreciate its many and varied cultural and historic treasures one has to make use of Trains. Trains or Regional bus-lines that use the newly constructed highways around Lanzhou are the best modes of transport to get around to Tianshui City, Linxia Hui, Gannan Tibetan Prefecture, Hezuo and Langmusi. Trains do best to connect to the Oasis Cities of the narrow Hexi Corridor shaping the Western 'neck' of the Province. Travel conveniently and comfortably by train to reach Wuwei, Zhangye, Jiuquan and Jiayuguan, Dunhuang and even beyond into Xinjiang-Uyghur Autonomous Region. Newly constructed Airports and speedier trains make for the best ways to reach far away Jiayuguan and Dunhuang, the latter beforehand a journey of some 17+ hours. It is some 900 miles from Lanzhou to Dunhuang. 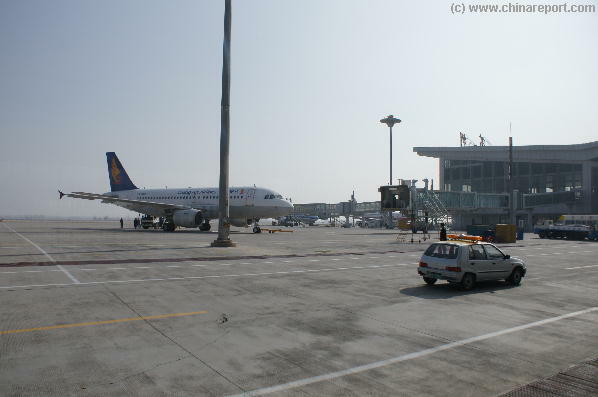 Lanzhou Zhongchuan Airport has air connections to Dunhuang and Jiayuguan in Gansu Province, as well as direct Flights to Yinchuan in Ningxia and Ürümqi in Xinjiang-Uyghur AR. The airport connects to many more destinations throughout the country. 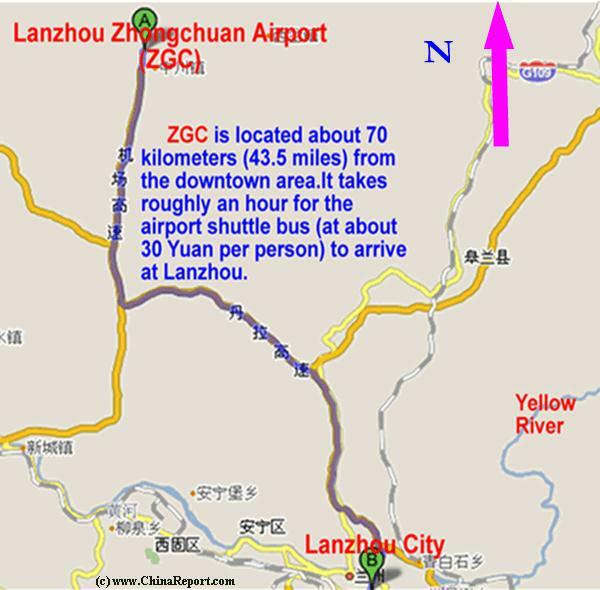 Lanzhou's Airport has been built some 70 kilometers due North-West of the City, near Zhongchuan Village. It is slightly more than one hour travel from the City Center by Car or Bus. Regular airport shuttle buses leave from the City Center (South Bank) at regular intervals. The City of Lanzhou serves important functions for both passenger travel and transport of industrial goods and materials. Thus, the city is extra-ordinarly well connected. Trains travel around the south-bank city and can be seen traveling along the loess ridges near the famous Main City Mosque. Several smaller stations and relays are found in Towns just to the south. There are two Railway Stations in Lanzhou City, one located due South of the City Center of Lanzhou and another at some distance away in the western city. The Main Railway Station is located south of the old city on ... street. 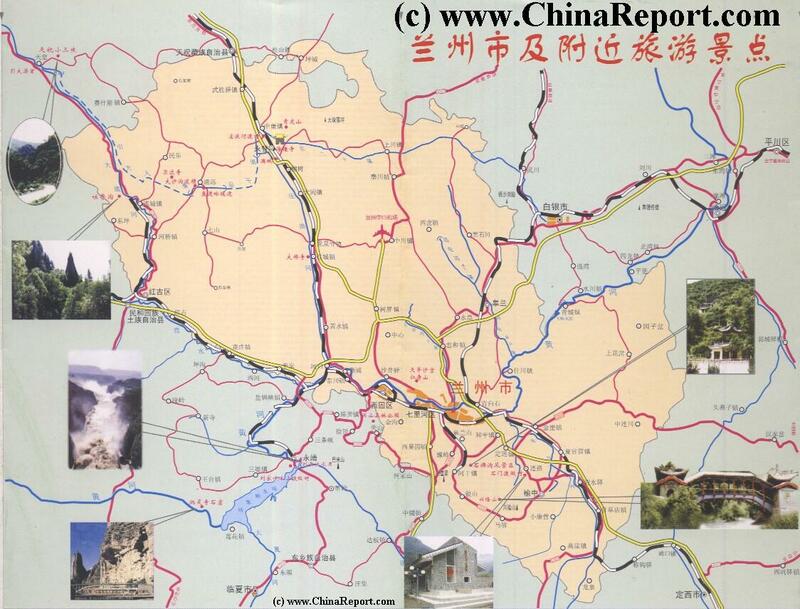 Lanzhou-Xinjiang Railway: linked to Xinjiang destinations only. Overview Map of Lanzhou City Prefecture, showing the locations of main towns mentioned, the districts and counties of the City of Lanzhou, Zhongcuan Airport and various sites of interest. CLICK MAP TO GO TO FULL VERSION ! !